I recently received an e-mail from the CEO of the bank that my wife and I use. Of course, the e-mail was the same song and dance about why the bank is great and safe. They listed all of their wonderful attributes, and they actually are doing quite well unlike most banks in America. One point did catch my eye though. The bank that I use has not taken a dime of taxpayers’ money. They have not used the TARP or TALP programs. They are standing on their own. There is something to be said about that that no one is really talking about. Banks that have not taken bailout money are sound, secure, and have practiced safe lending practices all along. They are well capitalized and have very little exposure to the sub-prime mess. 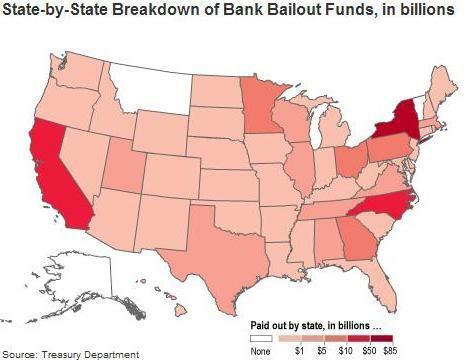 As of last count, there have been 555 banks in the United States that have required government money to continue operating. A friend of mine from college is a middle manager for a small regional bank in the southeast. And, I was quizzing him and raking him over the coals about whether or not the bank he worked for took TARP money. And, his response was, “Of course we did. Everyone did…well except The Palmetto Bank [in South Carolina], and they make sure everyone knows it too.” And, right they should. Bravo Palmetto Bank! Bravo! More banks should follow their lead. And, banks that have taken the money should hurry up and pay it back. So, I thought that it would be interesting to list a few of the banks that have NOT taken government money, the Department of Treasury’s Capital Purchase Program (TCPP), and will not accept TARP funds, during this credit crisis. Now of course this list is not all inclusive. I am quite sure that I missed a few. Please contact or e-mail me if there are any banks that I have left off and should add to this list. It’s good to know which banks haven taken TARP money, even if all that mean is a branding thing. But I can’t say much, my employer has taken billions in TARP money! My bank collected TARP money, but we are better capitalized than all of our peer banks. Frost Bank here is Texas turned down funds as well, it is a pretty large regional bank. Fascinating map but I would like to see it shaded by Dollars per capita instead of total dollars. Interesting list – – I am assuming that all of the banks on your list were actually “approved to receive” TARP funds by the Feds, for if they were declined, it could very well mean that the Feds don’t think they will weather the problems. Further, it would be interesting to size up the bank list by Asset Size, Liquidity and Capitalization. That would be a further eye opener. You are exactly right. All the banks on the list above were approved to receive government funding through the TARP program but chose not to accep the money. Thanks for the comments and adding to the discussion. Good for you Fritz and others can we have our money back please, I choose to not bail anyone out. My bank has received TARP money and is now putting the screws to me. No one should be “bailed out” it’s not real, free market flows always correct everything pretty quickly so we can get on with recovery tis will just prolong the suffering. If we extend to much in business when the music stops there are no chairs. ok so does this mean us bank corp DID take the bail out money???!!!!??? ?cuz if they did I’m moving my account!.. Another Washington State-based bank, 1st Security Bank of Washington (locally know simply as “1st Security Bank”) did not accept T.A.R.P. funds. In 2012, it did a mutual-to-stock conversion and trades under the symbol of FSBW on NASDAQ.